In deciding what books to read I am not 100% formulaic, but I do keep a few things in mind. I recognize that books follow a scale of difficulty (at least for me), I try to read thematically – following my curiosity, and I am conscious of the Copernican principle (Lindy effect). I was on vacation recently and had the opportunity to do a lot of reading. Over 15 days (long vacation, I know), I read seven books. Of those, four of them were fiction and were twice the length of the non-fiction books. When I read fiction (typically sci-fi and sometimes fantasy), I can’t put the book down. Over the course of two days, I read the entire Red Rising trilogy (1,400 pages). In contrast, it took me four days to read Thinking in Systems (just over 200 pages). This prompts the question, how can I read non-fiction books at the same rate as fiction books? Answer: I can’t. 🙁 (If you don’t have that issue…then probably not worth reading this section!) However, understanding the spectrum of difficulty and value a bit more may allow me to make better reading decisions. There are a few takeaways from the above chart. One, there are really three outcomes in reading: it provides entertainment, information on a subject, and/or mental models that one can use to see the world. In most cases, books overlap in outcomes. Team of Rivals was an entertaining read that provided information on Lincoln’s era and provided me with mental models around the importance of magnanimity and timing. 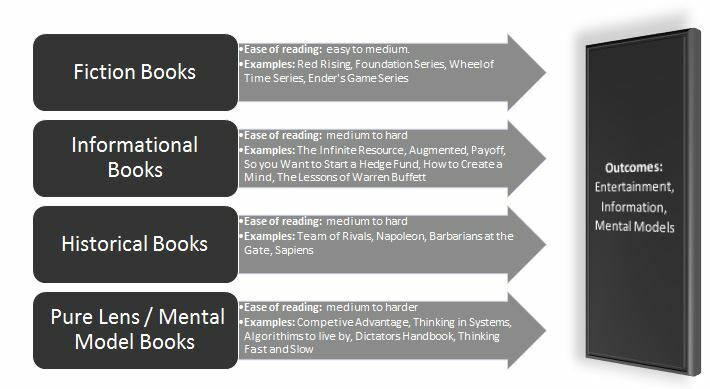 Two, by forcing a books categorization and explicitly assigning a reading difficulty to it, it allows me to be more selective in what “harder” books I read. If I pick up an informational or fiction book, the cost (measured in difficulty in reading and time spent on it (not time explicitly reading it but from the time one started a book to the day they finished it)) is much lower. The cost, however, for a harder book is much more. It takes much longer to get through and is in the background of my kindle constantly telling me to read it. Thus, it follows, that one should do extra due diligence on a more difficult book before starting it. I find that I read thematically due to my curiosity on a subject matter. (I won’t belabor the value of reading multiple sources with different viewpoints on a subject matter – that is a fairly well-established default position.) When you are hyper-curious about something leverage that. In the same way creatives cultivate and exploit their “muse”, cultivate and exploit your curiosity to dive into a subject. For once curiosity wanes, I find it more (it isn’t like the difficulty melts away, unfortunately, but it is less) difficult to get through the harder books. One of those topics is books. If Meditations by Marcus Aurelius is still relevant today (and I have no other data points aside from that), then it will be relevant for the duration of my lifetime. Any book that has the possibility to be relevant for the duration of my life sounds like a good book to read. Of course, I don’t eschew newer books purely for older books, but keeping this Principle in minds provides a solid base rate. Great post. I find your analysis of books interesting and have experienced some of the same issues. With rapidly evolving technology and business models how would you recommend someone finds the best books to educate themselves on the subjects? I sometimes find myself reading books/summary of a book that are only a year or two old but seem to be out dated. Also, how do you determine before reading who is on the correct path with so many differing opinions? Technologies and business models are very different. So let me separate those first. Business models are necessarily more complex since technology is a subset of them. I will leave the business models discussion for later and will focus on how I, personally, sift through the thousands of different technologies coming at us. As you zoom out along the technological spectrum, the ability to capture relevant information increases. Expanding on that, understanding VR and AR broadly but not understanding the specifics of Magicleap’s technology (a company within AR/VR) has the potential to last longer. So will you miss out on the latest and greatest but you should have more timeless information. So 1. unless I am highly interested or it is highly relevant to understanding something, I typically don’t read books that are highly specific to a new technology, trend, etc. Obviously that doesn’t perfectly protect against it. I recently read the Infinite Resource where the author discussed how it was very likely oil would stay above $100 for a long time…clearly he was wrong. However, there is still value in understanding why he made that prediction and what his reasoning / process was. Determining before reading is tough. In any industry / technology / discipline there are respected people / opinions. It takes time but eventually you realize there is a fair amount of consensus on who the “leaders” are. When I look for something on pyschology I look to Khaneman, Tversky, Gigerenzer, Ariely. When I am looking at ecology I see that Hardin and E.O. Wilson are respected. With all that said, in future posts, I will certainly elaborate on books that I have read, enjoyed, and aren’t necessarily as timeless. That might provide some further clarification, too.